Who says you need meat to make an amazing meal? 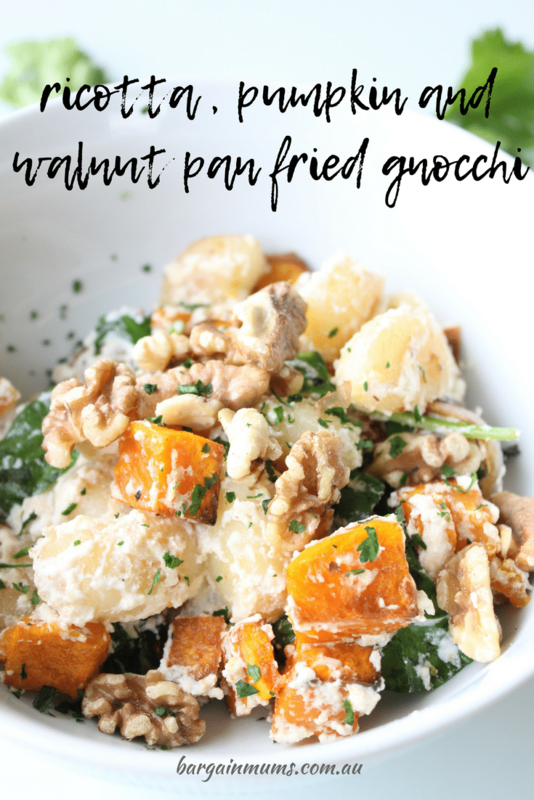 I like to have a few meat-free dinners each week, and this ricotta, pumpkin and walnut pan fried gnocchi fits the bill perfectly. There is something about these potato-ey pillows that makes a delicious and filling meal. The first step to this delicious pan fried gnocchi is to prep the caramelised pumpkin. First, preheat the oven to 200c and line a baking tray with baking paper. Peel the pumpkin and cut it into 1cm cubes. Slice the onion into 1cm wedges, then place both the cut pumpkin and onions onto the prepared oven tray. Drizzle with pumpkin and onion with a little olive oil and season with a little salt and pepper. Bake for around 10 minutes or until cooked through. While the pumpkin and onion mixture is cooking, cook the potato gnocchi according to packet directions. Drain and set aside. Next, make a start on the walnuts. Add the walnuts to a large frying pan over a medium-high heat and toast for around 3 minutes or until golden. Remove the toasted walnuts from the frying pan and set aside. Keep the frying pan on a medium-high heat and add a drizzle of olive oil. Let the oil get hot, then add the gnocchi in a single layer and fry it. You may need to do this in batches if the gnocchi doesn’t all fit in a single layer. Cook for around 6 minutes or until golden, tossing the gnocchi occasionally. Next, add the butter and garlic to the gnocchi and cook until the butter has melted and the garlic is fragrant. Add the white wine vinegar and cook for a further 1 minute, or until the vinegar has evaporated. Remove the frying pan from the heat and stir through the ricotta and water. Season with salt and pepper, then add the baby spinach leaves along with the pumpkin and red onion mixture. You can add a little extra water at this point if you feel the ricotta needs it. Divide the pan fried gnocchi between 4 bowls and top with the roasted walnuts and sprinkle with a little parsley. Preheat the oven to 200c. Line a baking tray with baking paper. Place the cubed pumpkin and red onion wedges onto the lined baking tray. Drizzle over a little olive oil and season with salt and pepper. Bake for around 20 minutes or until cooked through and starting to colour. While the pumpkin is cooking, cook the potato gnocchi according to packet instructions. Drain and set aside. Add the walnuts to a large frying pan over medium-high heat and toast for around 3 minutes or until golden. Remove from frying pan and set aside. Add a good drizzle of olive oil to the frying pan and pan fry the cooked gnocchi for around 6 minutes, or until golden. Add the butter and garlic to the gnocchi and stir until the butter is melted and the garlic is fragrant. Add the white wine vinegar and continue stirring until evaporated. 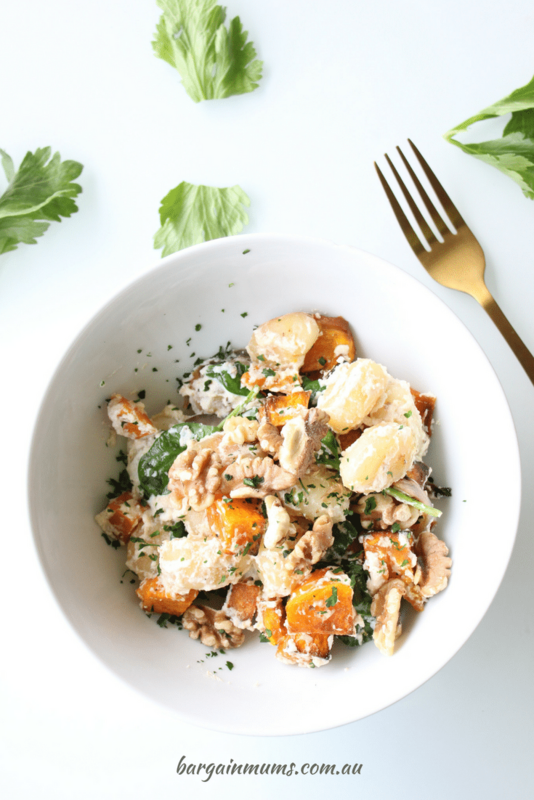 Remove the gnocchi from the heat and add the ricotta, milk, spinach leaves and pumpkin and onion mixture. Add extra milk if you feel the ricotta is still too thick. Divide the gnocchi between bowls and top with the toasted walnuts and a sprinkling of parsley.